Once we got away from shore this morning, the ocean was surprisingly clear. 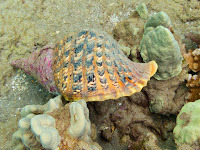 Kimi found a Triton (middle photo), a critical component of Crown of Thorns control. This Sea Star (bottom photo) was running as fast as it could in an effort to keep up with us. 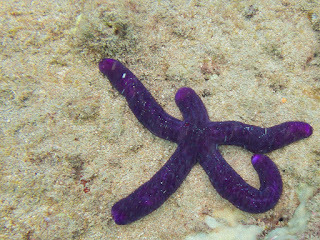 Where is the Sea Star's pink hat?